Most of us have struggled with a bad habit at one point or another. Whether it was making excuses not to go to the gym, or simply biting your nails. Bad habits interrupt your life, sabotage relationships, prevent you from accomplishing your goals and hold you back from realizing your full potential. This isn’t new information. We all know our bad habits can wreak some serious havoc on our lives, so why do we continue to allow them to control our actions? Well let’s start by considering what a habit really is. A habit is a routine or behavior that is repeated regularly and tends to occur subconsciously. Research has indicated that as many as 40% of the actions you perform each day are based on habit and not on conscious decisions. That means that almost half of all the things you do every day, you’re doing with no conscious thought process. That’s crazy! So what causes a habit? And how can you break a bad habit and replace it with a good one? 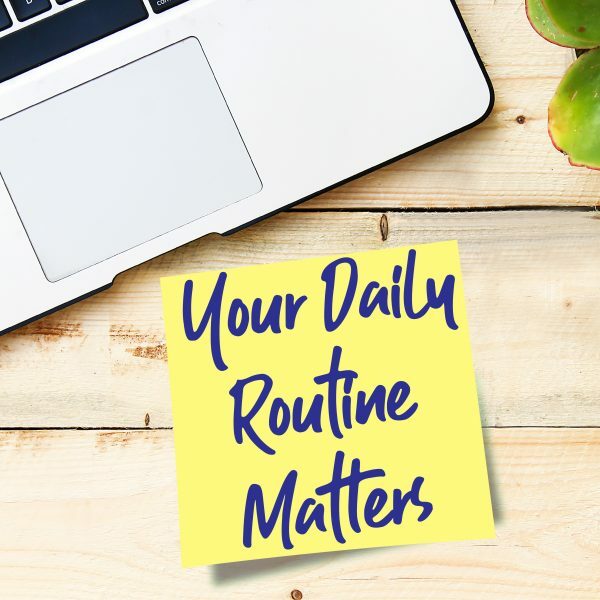 We need habits so that we can operate efficiently throughout the day and save our mental energy for more important things like developing a better border control policy or improving the battery life of our smart phones! 😉 When habits are used appropriately, they actually allow us to get more done and are beneficial to our overall well-being. Bad habits however, can have an enormously adverse affect on our health, productivity, financial security and happiness. More frequently than we realize, bad habits are created in response to an uncomfortable situation or emotion that we’re trying to avoid. They are born out of an avoidance coping mechanism. Two of the most common modern-day causes for bad habits are stress and boredom. Think about when you’re feeling either bored or stressed, it’s not an enjoyable experience is it? Both emotional states have a tendency to bring up feelings of anxiety, tension or discontentment. So we look for something quick and easy to entertain or occupy our minds, something that not only distracts us, but that promotes a feeling of well-being. A lot of the time this results in unsavory habits like overeating, trawling through social media or binge watching tv. In fact, everything from biting your nails to overspending on a shopping spree, to drinking every weekend, to wasting time on the internet, can be a simple response to stress and boredom. The issue becomes that even after relatively few repetitions of this habit loop, our brains start to crave the hit of endorphins we get from this kind of activity. It’s the craving and anticipation of this endorphin hit that becomes a powerful driving force behind the resilience of our habits. So if avoiding how you’re feeling is a natural coping response for survival, AND our brains are hard-wired to drive the action that will satisfy its craving, is it even possible to break our bad habits? Thankfully, it is! With some awareness and a lot of patience, you can teach yourself new and healthy ways to deal with stress and boredom, to substitute in place of your bad habits. Something you may already be aware of and that I just touched on, is that habits are incredibly resilient. In some studies, research has shown people with extensive brain damage who could not even remember where they lived, could still adhere to their old habits and pick up news ones. This is because the part of the brain where habits are learned and maintained, can function normally even if the rest of your brain is damaged. You may be asking yourself, so what hope do we have?! Well, even though habits are hard-wired into our brains, it is possible to form new habits through repetition and awareness, which can displace the old ones. The first step when it comes to breaking a bad habit is learning what is causing it. That could be a deeper issue under the surface layer of stress, or it could be something quite simple like an environmental trigger. Each person is different, so take the time to identify what specifically is causing the bad habits in your life. In any case, once you have identified a bad habit and have a better idea of what causes it, one of the best ways to break that bad habits is by replacing it with a good one. For example, if you smoke when you get stressed, then it’s a bad plan to “just stop smoking” when that happens. Instead, you should come up with a different way to deal with stress and insert that new behavior instead of having a cigarette. Similarly, every time you find yourself getting peckish around 3pm, instead of reaching for your go-to mid-afternoon cookie, instead you reach for a tall glass of water and then go for a 10 minute walk. As I mentioned above, rather than eliminating a bad habit, you should aim to replace it. Additionally, it’s best to have a game plan when boredom or stress comes knocking on your door. If you consistently snack between the hours of 5-7pm because you’re home with nothing to do, then get yourself a new hobby or project that you can work on outside of your house. If you start feeling like going to the gym is the last thing you want to do, get up and do a few jumping jacks or set up your day so that you go straight to the gym on your way home from work. Anticipate that you will be tired at the end of the day and not feel like going to the gym! If you are constantly tempted not to work out, start planning workouts ahead of time and get a friend to join you. You will be a lot less likely to skip something when you have made a commitment to someone else and already have a plan of what you’re going to do once you get to the gym. Breaking a bad habit can be difficult, and you may not always succeed on the first try. So rather than beating yourself up over a mistake, anticipate it. We all get off track sometimes and that’s okay! What’s important is that you are able to pick yourself back up, learn from your failures, and continue working towards your goals. Think of a habit you want to create, and write it down. Next, think of your cue. Write it down. Now, think of your reward. Write it down. Finally, remember to make sure the reward is something you’ll be able to crave or anticipate as you create this new habit. Habits are incredibly resilient. In some cases people with extensive brain damage who could not even remember where they lived, could still adhere to their old habits and pick up news ones. So, cut yourself some slack! The resilience of habits means that even if you kick a bad habit, (like binge eating every time you get off the phone with your mother) there will always be a risk of relapse. If you do relapse, congratulate yourself for being a human being! Dust yourself off and get back to your flexible eating ways.Don’t get caught up in how your bad habits make you feel. Instead, start identifying what causes them, when they happen, and how you can replace them. At Own Your Eating we know just how difficult it is to break a bad habit. The first step starts with acknowledging that it exists and identifying your habit triggers. The next time you find yourself acting on autopilot in a way that is not beneficial to your overall goals, take a time out to consider what your thought process and emotional experience truly is. Download our FREE Behavior Awareness worksheet so you can start deconstructing your habits and enjoy a healthier and happier lifestyle today! Our Lifestyle Coaching program is designed to help people overcome their bad habits. We help clients reduce instances of overeating and lose weight by helping them develop awareness and create new healthy habits. Our coaching platform provides daily reminders, accountability and a sense of accomplishment that enhances the support you get from your one-on-one coaching and helps our clients feel more empowered. If you struggle combatting issues like overeating or you lose weight and struggle to keep it off, then check out our Lifestyle Coaching memberships or feel free to contact us and let us know how we can best assist you!